The world of USB microphones saw a rapid rise in popularity with the advent of podcasters, digital vloggers, streamers, and more. A high-quality microphone is a must whether you want to record in your home studio or in a professional environment. But before choosing the right microphone, there are a variety of things that you need to carefully consider, including its performance, durability, built, and more. Today we have decided to compare and review two of the most popular microphones that have become favorites among users. 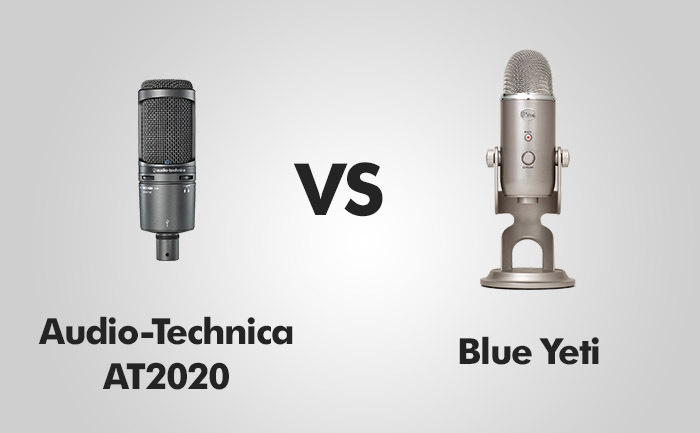 Audio-Technica AT2020 USB+ and Blue Yeti USB Microphone are well-known for offering high-quality and phenomenal results. Here is an in-depth comparison between them to ensure that you buy the best microphone possible. The built of both the microphones are quite nice and sturdy. At2020 USB+ boasts a complete metal body, with metal grills. The body is carefully crafted and is extremely strong and durable. The microphone has a convenient LED light to indicate whether the microphone is connected to your computer or any other device or not. Two new dials that were absent in the previous model have been added. The first dial gives you optimum control to mix your microphone audio and your pre-recorded computer’s audio, without any glitch or decrease in your mic’s zero-latency monitoring and audio out from DAW. The second one gives you better control over your volume. AT2020 USB+ also offers a 3.5mm headphone port to connect your headphones with the microphone. Blue Yeti is somewhat similar in built mainly to the fact that it also has a solid metal body. Primarily marketed as a studio mic, it is a bit larger than some other models. While the overall built is quite strong and sturdy, we found the control buttons to lack the same quality. They seem to need careful handling and are quite flimsy. At the base, Blue Yeti offers a threaded base, a 3.5 mm headphone jack, and a mini USB port. The threaded base allows you to attach your microphone to any regular microphone stand. A headphone knob to adjust the volume and a LED-illuminated mute button makes the design quite modern and convenient. The features that significantly differentiate Blue Yeti from AT2020 USB+ are the two extra knobs, one for pattern selection and the other for gain. It offers four different sound capture patterns for an enhanced and versatile recording. The Stereo Mode, the Cardioid Mode, the Omnidirectional Mode, and the Bidirectional Mode are perfect for people who want an advanced and professional recording experience. The gain knob is another significant and critical addition as it helps you control and adjust the loudness of the sound that is being captured by the microphone. It helps you salvage the recording at the basic level from being distorted and too loud. As you can see, when it comes to the build, AT2020 USB+ might be more sturdy and strong, but when it comes to the features, Blue Yeti is the definite winner. AT2020 USB+ has built quite a fan following because of its enhanced audio quality and we cannot disagree. The sound is accurate, clear, and very crisp. The microphone boasts a steady frequency which makes the audio so much more musical and enjoyable. With the frequency of 20Hz- 20 kHz, the mic sounds clear and lively on a number of genres including electric guitar, acoustics, and more. The polar pattern is a bit wider than most people like but is nothing major. Although, the one problem you will face with AT2020 is the sound quality of the higher notes. The higher notes are a bit compromised and can cause some hindrance. When it comes to the audio quality of the Blue Yeti, the mic has done a surprisingly great job for the price it asks for. The sound is quite rich and will be perfectly suited for vocalists and digital streamers. With a THX certification, the microphone offers an accurate and exact frequency range. But, it too has its shortcomings. One of the main problems you will face is the sensitivity of the mic. It picks much more than it should, and you will have to deal with some unwanted noise. However, picking the right pattern can help you avoid this problem and achieve better noise cancellation. Professional recording requires a lot of expensive accessories that not everyone can get as easily. Therefore, it is crucial to ensure that your microphone attest provides the basic necessities for recording. AT2020 USB+ provides its buyers with a pivoting stand mount for 5/8” with 27 threaded strands, 16 threaded adapter of 5/8”-27 to 3/8”-16. You also get a 10’ USB cable, a tripod desk stand, and a protective pouch. While Blue Yeti does offer a plug and play USB interface and has a strong and decent-enough in-built stand, it does not offer anything else. If you must use a tripod or want to mount it on a higher surface, you will need to spend your money and buy the attachments. If you are looking for a microphone that comes with the basic accessories, you might want to go with AT2020 USB+. PROS: Sturdy build / Offers additional equipment / Clean and crisp sound / Steady frequency range. PROS: THX certified / 4 sound capture patterns / Rich and accurate sound / Mic gain control. CONS: No sound capture patterns available / Wider polar pattern / No mic gain control. CONS: Flimsy buttons / No added accessories / Picks unwanted noise. Both AT2020 USB+ and Blue Yeti are significantly good in quality and sound. While AT2020 is more sturdy and durable, Blur Yeti offers more enhanced features. At2020 offers a clean and crisp sound with steady frequency range while Blue Yeti boasts varied capture patterns and mic gain control. Your choice solely depends on your requirement and preferences, as we found both the microphones adeptly impressive and of great quality.